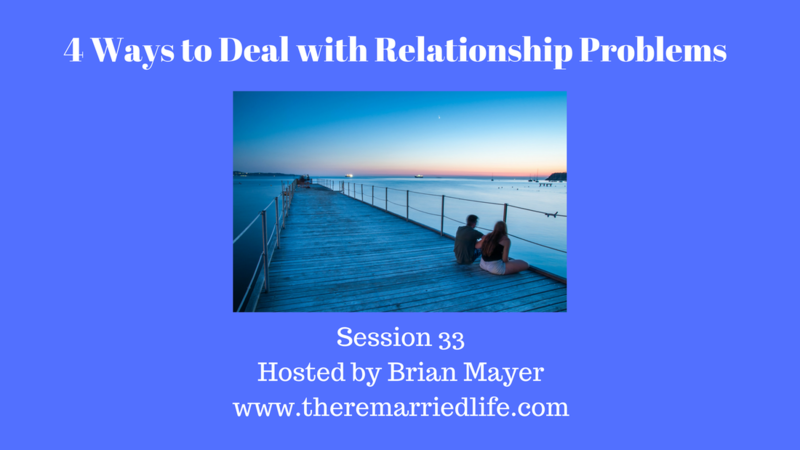 Conflict and issues in relationships are inevitable. When I hear couples say that they never argue or disagree, then I know there is a problem. More than likely they are not communicating or connecting enough. That being said, it is more in how you manage and/or resolve these conflicts that are important. Do I have control over this issue? Will I work to change what I can in this situation? These are two very simple but powerful questions. You might think that they are mutually exclusive. In other words, the thought is that if I just control (deal) the issue that I will not have to work to change it, or if I change something it means I no longer deal with it . This is not true and that you can answer yes or no to each question independent of the other. The answers to your acceptance of the issue and the desire to work toward change, will produce 4 possible outcomes and we will detail them now. Option 1: Change Perspective/Regulate Emotions. If you answered No to Acceptance, but Yes to Change, then this means you have to turn inward to change your perspective or regulating your emotions. Changing your perspective involves looking at things in new ways. Regulating your emotions may mean doing things like breathing, finding things that are relaxing, or even doing something like counseling. Option 2: Tolerate the Problem. This happens when you say Yes to Acceptance, but No to Change. Tolerate means that you will allow the existence of the issue without interference. So in other words you choose to go on with your life in spite of the issue being present. This can be tough and will be a day to day battle. The problem may not go away, but that you will learn to live with it. This can happen when you look at the big picture and realize this issue may play a small part and is not worth the attention to change. Option 3: Stay Miserable. Yuck, who wants this one. However, we often find ourselves at this impasse. When we say No to Acceptance and No to Change, we are often mired in the depths of the problem. This can often happen if we have a negative view of ourselves which in turn creates low self confidence or low self-esteem. Conversely it can also happen when we place to much blame on the other person. This often will cause us to believe that we have no options because the control completely lies with the other person. Option 4: Solve the Problem. If you answered Yes to Acceptance and Yes to Change, then you know that you have the motivation and ability to fix the problem. In a romantic relationship, this is always best done when you both can attack the problem together. There is much more power when you both unite to work on an issue together. For example, communication that consistently goes sour is an issue that is common when two people live together for any length of time. When you both recognize, accept the issue and make concrete and detailed plans to change then your response to the problem will change. Just remember, your answers to 2 simple questions regarding acceptance and change can be a powerful indicator in how the issue will ultimately turn out for you.